This is an amazing book. A bit slow at the beginning but as the story unfolds many pieces click into place, and I ended up savoring all the details and the individual stories entwined in the plot. Highly recommended! I picked this up to give Abercrombie a try, he's so praised (deservedly so!) that I wanted to try a standalone novel before approaching the first law trilogy. Unfortunately I didn't dig enough in the reviews to understand a particular tidbit of information, and now that I'm reading "[b:The Blade Itself|944073|The Blade Itself (The First Law, #1)|Joe Abercrombie|https://d.gr-assets.com/books/1284167912s/944073.jpg|929009]" I'm noticing I have somehow spoiled a little the story. 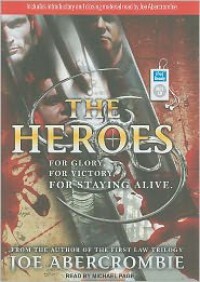 That is, The Heroes is a standalone book but it's not simply set in the same world, its events are after those of the trilogy. Best reading them in order.